Autumn is my favorite season. The weather cools down (or is supposed to!). Leaves start to change color in our part of the country. Winter squashes like butternut and acorn ripen. Apples appear in the farmers’ market. Hmmm…nice time of year! 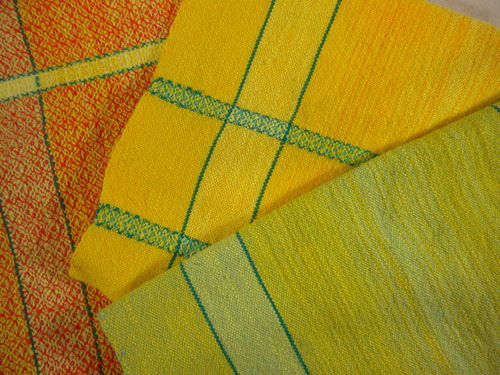 The lemon yellow and daffodil gold hand towels are finished and off the loom. Spearmint green worked well as a weft, so that showed up in more than just one towel. These soft colors complement each other. The burnt orange pushed the yellow to the other side of the spectrum and resulted in a sassy, bold look that made the woven motif pop! The hand towels were quickly replaced on the small loom with warp for overshot table runners. Overshot is a weave structure most often seen in early American coverlets. Snowballs, roses, stars, pine trees and other figures combine to make the overall design. Usually, overshot is woven on a finer warp using a heavier “pattern” weft alternating with a finer “tie-down” weft. Having two wefts means weaving with two shuttles but they are needed to create a stable cloth. The longer floating weft threads of overshot give the structure its name. Each throw of the shuttle is called a “shot.” The pattern weft is shot over several warp threads before being tied down. The advantages are very clear motifs and uninterrupted colors. Because of the floats, an overshot works better in textiles like coverlets or table runners rather than kitchen towels. For these runners, the red threads float over the natural threads to show a bright rose-like figure. The variety of overshot designs make them popular for traditional weaving. 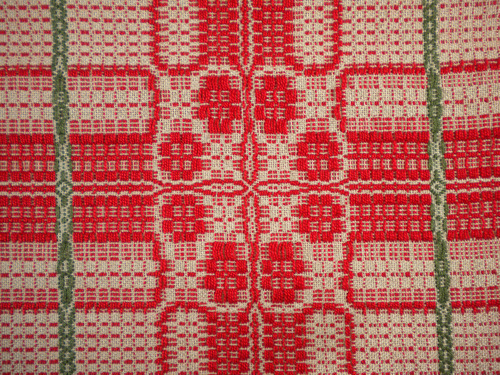 Volumes have been written, tracing the motifs through the various parts of the country.American Woven Coverlets by Carol Strickler (1987, Interweave Press) is a great resource. American Star Work Coverlets by Judith Gordon (1995, Design Books) is another. Look them up to find out more about overshot!